Frazzled and forlorn Rebecca, played by Keira Naughton, is still mourning the pet dog who died a year ago while she struggles to negotiate the online dating scene. Her brother Jamie (Andrew Rothenberg) has a history of manipulative and selfish behavior, and is about to get married to a woman whose own egocentricity does not augur well for a happy union. Jamie’s 15-year-old daughter, Sadie, played by Ariana Venturi, has just landed in hot water by making a sexually explicit cellphone video with a couple of high school football players. Grandmother Daphne (Linda Gehringer), the gruffest imaginable matriarch, appears to be more interested in her electronic cigarettes than in any of them. All in all, this combative clan presents a multigenerational portrait in dysfunction — and they are mighty invigorating company in this razor-sharp, thoroughly engrossing world premiere. Directed with laser focus by Jackson Gay, “I Saw My Neighbor on the Train and I Didn’t Even Smile’’ is a co-production of Berkshire Theatre Group and New Neighborhood, a just-created theater and television company. Rebecca has been pressured by Jamie into allowing Sadie to temporarily live with her in her Illinois apartment because his bride-to-be has no use for the girl. Cast adrift, Venturi’s Sadie wears a bored, above-it-all sneer, her faraway gaze suggesting she’s trying to absent herself from any room or situation she is in. But the beauty of Venturi’s performance, one of the best I’ve seen all year, is the quality of fierce self-awareness she brings to the character and the way she eventually reveals just how raw Sadie’s nerve endings actually are. Sadie’s vulnerability becomes clear, in different ways, when she drifts into a disastrous pot-smoking encounter with a guy Rebecca has met on an online dating site (played by Adam O’Byrne) and when she makes a kind of connection with a geeky, socially awkward math whiz named Eric (Adam Langdon). The acting is strong across the board. 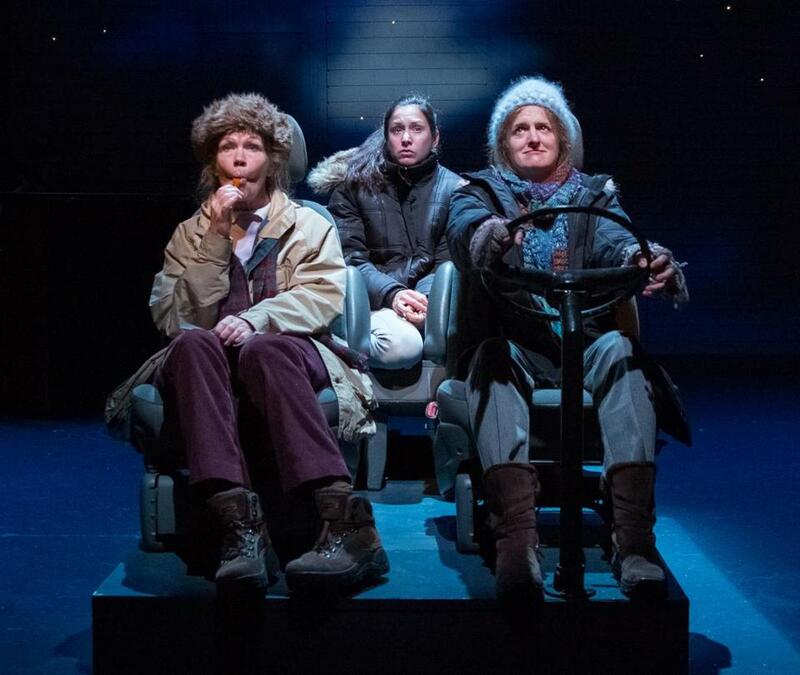 Naughton, who directed her father, James, in Erik Tarloff’s “Cedars’’ last summer at Berkshire Theatre Group, does an exceptional job capturing the pain, anger, sadness, and longing beneath Rebecca’s goofy-loser persona. Gehringer, who gets many of the play’s laughs with caustic one-liners, is equally deft in finding the layer of humanity beneath Daphne’s crusty exterior. Founded by what it describes as “a collective of artists scattered across the country,’’ and puckishly proclaiming a “sincerity and authenticity [that] are so combustible, it cannot be housed under one roof for too long without doing severe structural damage,’’ New Neighborhood clearly possesses a sense of humor to go along with its adventurous aesthetic — two qualities that are always welcome in the theatrical neighborhood. Composer, Ryan Kattner. Set and lights, Paul Whitaker. Costumes, Jessica Ford. Sound, Broken Chord.